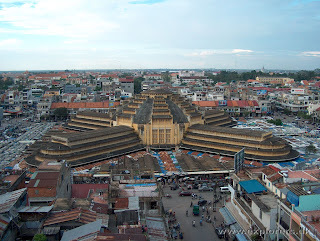 If you have been to Cambodia - A destination you should not miss is the Central Market which is located in the center of Phnom Penh Phnom. Central Market or Psar Thmei is a "must-see" for tourists to Cambodia's capital, furthermore it is also an important economic hub for business transaction for Cambodian People. In the market you can find many things ranging from fresh flowers to clothes, souvernir to fresh vegetable and cooked food. You can find loads on grilled seafood in Central Market too from the afternoon time. Some of the grilled Seafood you can find in Central Market are: Shrimp, Fish, Sting ray, small octopus, large octopus and you can also buy river lobster there as well. A few types of vegetable locally grown in Cambodia and some herbs. To eat together with oysters. Koh Kong Sauce to eat with oyster. I am not a fan of oyster, but most men loves oyster including my hubby. You can find fresh oyster in most of the beer garden in Phnom Penh, Siem Reap and other provinces. 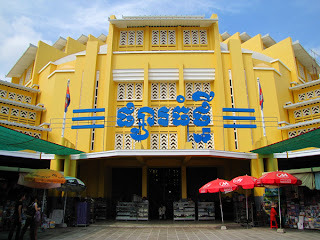 The place we like to go for fresh oyster are Sovann Beer Garden and SONYVID Beer Garden in Phnom Penh. You can ask for smaller or bigger or the biggest, they have all types of oysters. SONYVID is the name of a Beer Garden Restaurant serving only fresh seafood and beers. Today I've tried Grill crab rubbed with spicy sauce and the other one just cook fresh without any spicy sauce. It takes quite a while to be able to eat this dish, so I would recommend the earliest possible when you enter into the restaurant - but it worth the wait. You can find loads of fresh shrimp in Cambodia not only in Sihanoukville and Kampot Province but those good quality shrimp also delivered to Phnom Penh daily. You can find various size of shrimp ranging from small size to bigger size and larger size. Fresh shrimp from Cambodia is so sweet when u lightly steam with coconut and out from the po- when you eat - It tastes so yummy - I would recommend for everyone. Here is another way of cooking shrimp. You can grill the shrimp on charcoal. It tastes great simply with fish sauce and a little bit of lemon juice. Here is the picture of shrimp deep with Koh Kong sauce. You are advised to have a few bottle of water or beer next to you when you deep your shrimp with this Koh Kong Sauce because it is very spicy. Shrimp deep in the Koh Kong Sauce. This afternoon my lunch with my daughter and my husband was Spaghetti and 2 salads. My daughter's favorite Spaghetti is Bolognese. Here are the picture of today's lunch at Brown Cafe in Cambodia. They springle awesome amount of shredded cheese on top of the spaghetti and that's why we love to go there. So yummy.